If you are searching for a best-in-class coffee maker, then you’ve come to the perfect place. 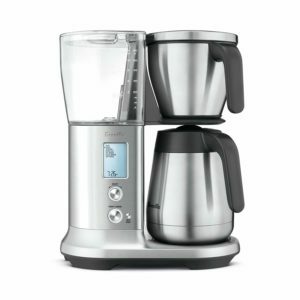 In this post, I’ll share breville precision brewer review. So without any more ado, let’s start our discussion. Actually, the Breville Precision Brewer has the same basic shape with other top-notch drip coffee manufacturers but its parts settle in a long yet narrow base. The left side of this coffee machine features a tower that holds the heating system, providing supports to electronics as well as controls. A water reservoir is also present in the above part that’s built with clear plastic. The Breville Precision Brewer is also featured with the options for cold brewing and also a “pour over” option that’s something state of the art stuff. For using this option, you have to buy some additional components. Another worth noting facility of this coffee maker is its fast brewing time without compromising in quality. It’s specifically needed when you have guests in your home that means coffee cups need to be filled promptly. Now, let’s discuss its features, benefits, and shortcomings in detail. The Breville Precision Brewer has come with a separate Gold Cup setting that has met all the standards for SCAA certification like its brew temperature is between 198 and 204°, total brew time is under 8 minutes and you’d get an even wetting of its coffee bed. Its other dedicated drip brew modes are featured with ‘fast’ for a faster brew that increases flow rate and ‘strong’ that lowers it. This coffee machine also offers a ‘My Brew’ setting that provides you with direct control over bloom time, temperature, and flow rate. Each mode of Breville Precision Brewer accepts brew sizes in between 8 and 60 ounces and helps you adjust for regular or #4 cone flat bottom filters or the attached goldtone reusable basket filter. Its extra-flexible basket design has come with brew options that are not usually seen in regular drip brewers, such as automatic cold brewing, settings for automatic pour overs accompanied by a Melitta or V60 in place of its drip basket, and over-ice brewing. If you are enthusiastic about more than one brew methods, the multi-use design of the Precision Brewer will help you a lot. Breville Precision Brewer has come with patent-pending Steep and Release valve that holds the water in the contact with the coffee and you can even brew small cup volumes without the presence of carafe in place on an automatic basis. Within Gold Cup preset mode, the particular coffee maker is able to automatically adjust the water temperature plus brew time to fulfill the standards set by the SCA. Owing to this coffee machine, you can brew any amount of coffee as per your personal preference and it has become possible with its Flat Bottom and Cone Filter baskets (both attached). Accurate and Adjustable Temperature: A delicious cup of coffee needs accurate control over temperature, contact time, and flow rate. Its PID Control is meant for precise and adjustable digital temperature control. Owing to the pump, you could select from three different flow rates for optimizing the contact time. The brilliantly-designed Thermocoil Heating System is able to deliver water –purer as compared to the usual brewing systems (that makes use of aluminium). My Brew Setting: This incredible coffee maker enables you to personalize different parameters, such as bloom time, flow rate, and brew temperature to match the specific coffee that you’re using – be it more fruity, floral, or earthy. Dual Filter Baskets: With the help of the dual filter baskets, you can easily brew any amount of coffee in the way you want it – thanks to its Flat Bottom as well as Cone Filter baskets (both of them attached). Auto ‘Steep and Release’ Technology: The Steep and Release valve of Breville Precision Brewer are capable of holding water with the coffee in contact and thus even without placing the carafe, you can brew a small cup volume of coffee on an automatic basis. Automatic Presets and Customizable: Breville Precision Brewer is featured with six unique brewing modes through which you could relish the perfect, balanced coffee, as per your convenience. Its preset modes have Gold, Strong, Fast, Cold Brew, Iced, and My Brew. Moreover, My Brew enables you to fine tune as per your taste just by adjusting bloom time, brewing temp, and flow rate. You can also brew pour over by making use of a drip adapter with your preferred pour over device. Owing to its advanced hardware, the Precision Brewer is incredibly flexible. Moreover, you’d get six automatic brewing modes from which you can select the preferred one. A “fast” cycle can push hot water via the machine as fast as possible. The “gold” setting instructs the machine to brew, as per the strict “gold cup standard” – according to the definition of the Specialty Coffee Association or SCA). When you use the “strong” mode, it would increase the brew time and also increases the temperature. Thus, the grounds would be extracted more minutely. Breville Precision Brewer stands at just 16 inches below. This coffee maker is a little bit tall to accommodate under some cabinets. With a myriad of features and functionalities, it’s not a “simple” brewer that means you have to devote some time to discover your preferred settings. I hope that the breville precision brewer review was insightful for you and I have successfully introduced a top-notch coffee maker for you. 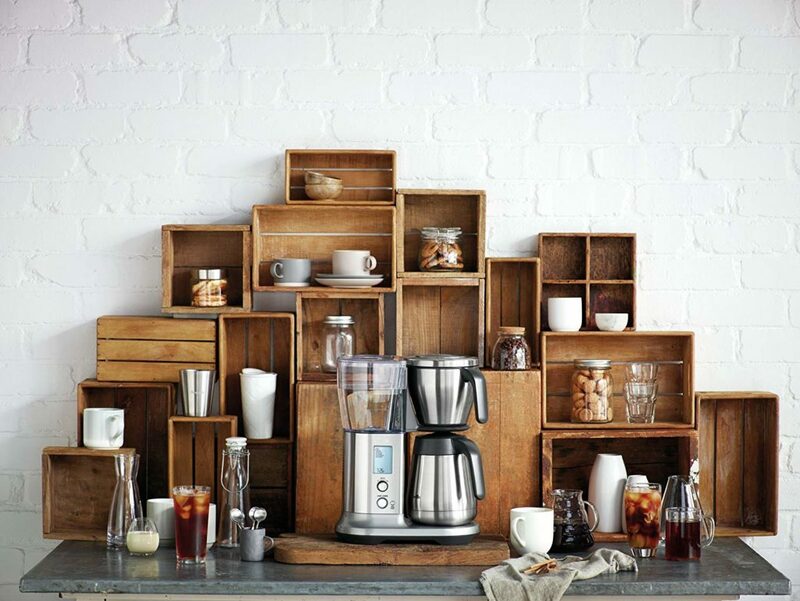 Bring Breville Precision Brewer to your home and keep exploring your barista skills. If you’re looking for a cost-effective coffee machine, Breville ESP8XL Café Roma can be an ideal option for you.